Now, for something completely different: here are some of my top game (and apps) picks of the Steam Winter Sale of 2017. The start of the sale was on December 21, 2017, and it ends on January 4, 2018. As is the case with recent sales, games are discounted but there is no dynamic nature anymore. 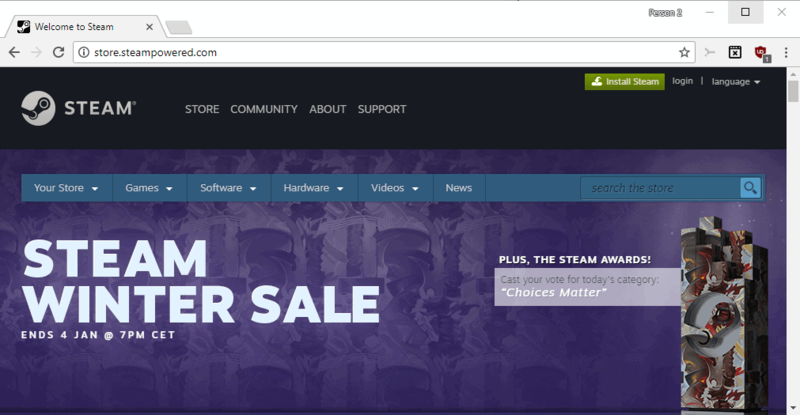 Previously, games could be discounted even further in Flash sales or daily sales, but this is not the case anymore. This means, basically, that you can make purchases at any time without having to worry about games being discounted even more throughout the sale period. While that is great, it takes some of the excitement away in my opinion and makes these "events" particularly boring. The following selection of games is based on a mixture of ratings and my own personal taste. I'm not a mainstream gamer anymore which is why you won't find Triple A games below. Quite a few are discounted in the sale, and they are usually listed prominently in the store. Feel free to post your own suggestions in the comment section below as well. Orcs Must Die! 2 and the first part of the series are fun games, especially if you play them in co-op with a buddy. You defend rifts from invading monsters in the game. You build traps in each level that activate (mostly) automatically, but control a character as well which can shoot and attack monsters independently. Panzer Corps is a turn-based strategy game that is an unofficial successor of the classic Panzer General. It plays mostly in the European theater of war and there from a German perspective and covers the entire war including some "what-if" scenarios just like the original Panzer General game (e.g. invading the United States as Germany). You can buy DLC for the game to add Soviet, Allied, U.S and the Afrika theater to the base game. The whole DLC bundle is discounted as well and available for $28.41€ (including the base game). Portal 2 is an awesome game that plays best with a friend in my opinion. Portal is a puzzle game at its core in which you complete puzzles in a series of test chambers. The main focus of the game is the use of portals, for instance to redirect the flow of water or move objects from one location to another. You can grab the base game on the cheap during the Winter sale. You can use Steam Link, a hardware device, to link your gaming PC with any TV in your house. It allows you to play games on your TV. Steam Link supports wired and wireless connections, and supports various gamepads, keyboards and mice. Terraria is a fantastic game about exploration, building, digging, and survival. I found it to be a very relaxing game by just digging around and exploring the game without really building something and creating more powerful weapons, tools and stuff, but if you like that, there is loads of content in this regard in Terraria as well. Works really well with a bunch of friends in my opinion. Tyranny is an old-school roleplaying game from Obsidian Entertainment that plays similarly to Baldurs Gate, Icewind Dale, and the company's previous smash hit Pillars of Eternity. The story is quite interesting, as it is told from the perspective of the "bad" guys, and involves having to make difficult decisions over and over again. At its core though, it is an RPG with character classes, races, stats, magic, and lots of items. Borderlands GOTY + Borderlands 2 Bundle (11.99€) -- This includes Borderlands Game of the Year edition and the sequel Borderlands 2. Broforce (3.49€) -- Fun game in which you play lots of action heroes from the 80s. Play with friends for the ultimate kick. Day of the Tentacle Remastered (3.74€) -- DOTT is still one of the best adventure games ever made, and this is the remastered edition. You can also grab other remastered editions of LucasArts adventures on the cheap during the sale. Eden (1.99€) -- Eden is a visual novel that features an interesting story and characters. Hotline Miami + Hotline Miami 2 (4.99€) -- This is a mature-themed action game and its sequel. Inside (9.99€) -- Inside is a 2D puzzle platform game from the makers of Limbo. Legend of Grimrock Bundle (9.51€) -- Classic 3d roleplaying game similarly to Dungeon Master, Eye of the Beholder and other classics. One Finger Death Punch (0.99€) -- This is an intense 2D fighting game. SOMA (5.59€) -- an underwater Sci-Fi horror game from the makers of Amnesia. The Long Dark (7.99€) -- A solo game about exploration and survival that plays in a frozen wilderness away from civilization.